A tripod is an essential tool for long exposures in low light and night photography. It is the preferred method for stabilizing to avoid blur from hand-held camera shake. But reliable as it is, reasons for not using a tripod are many. Carrying a heavy, bulky tripod is something most people would prefer to avoid, especially travelers. It takes time to set up and take down for every shot. Traveling companions may resent the wait. A tripod may attract unwanted attention from curious onlookers or security guards. And there are places where a tripod is impractical or prohibited: crowded museums, cathedrals and castles for example. So you have no tripod and you must capture a low light night scene you wouldn’t dare hand hold. What to do? HandlePod is the answer. It is a handle backed by four rubber-tipped feet that you can hold by hand against any solid object for tripod-like stability. Find a convenient support, press the HandlePod against it with your hand and shoot. It is fast, simple and dependable. What if you want to attach it to an object for hands-free use? HandlePod comes with an elastic cord what will secure it to many supports, even large ones. Wrap the cord around the support and cinch it back in the handle’s slot. It holds securely and won’t come lose. No support object available? HandlePod is a comfortable handle that provides a solid grip and better leverage to increase stability for hand-held stills and shake-free video. 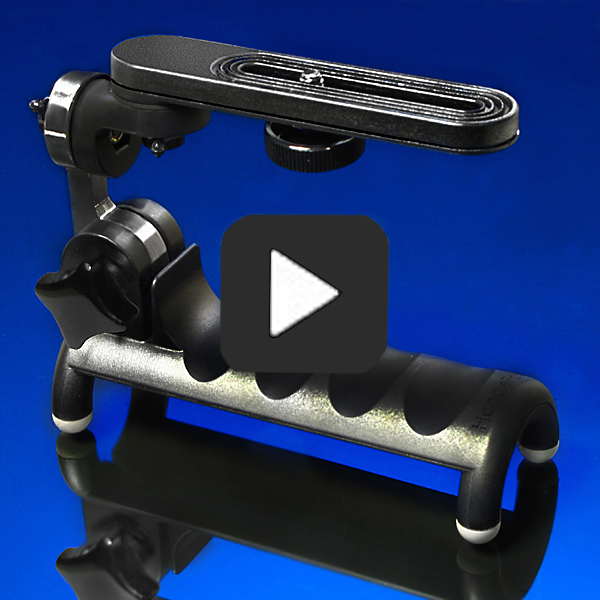 Versatility and a wide range of uses make HandlePod the ultimate tripod alternative. This entry was posted in Tripod Alternative on October 16, 2014 by main user.